Animal fats are rich in oil. That is the way nature stores the surplus from the good years beneath the skin. After we subject meat to heat in cooking, the fats congeal as grease. Whether meat or vegetable, grease has a low flash-point. Throw a piece of chicken skin on glowing coals and see what happens. 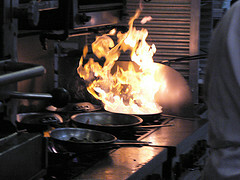 Unintended cooking fires have been a problem as far back as history goes. The Great Fire of London started in a bakery and reached 1700 °C / 3100 °F when it melted pottery. Cooks learned the need to keep kitchens clean and naturally ventilated. This helped until the advent of modern gas and electrically fired stainless steel cooking equipment. In today’s rough and tumble kitchen environment, where speed is all important, accidental fires are easier to start. Poorly maintained gas equipment can cause flashbacks and explosions. Electric fryers may appear sealed to protect the electrical control components inside, but soon start leaking. When did you last see an undented pot in a big kitchen? This is not to say that chefs are untidy. They do their best, but are not technical so they only clean what they can see. If you are in the health and safety business, during your next inspection, examine the back or innards of appliances with a flashlight. We recommend you wear gloves and that’s not only because the edges are sharp. When cooking oils heat up, they release atomized fatty globules in the air. As these settle, they descend on your hair, clothes, counter tops, and everything else. The industry solution is to vacuum it up into the exhaust hood, filter it and expel it to the air outside. There is just one problem. Hood filtration is not 100% efficient and if not regularly maintained filters admit the atomized grease into the duct where it accumulates. Every kitchen has the occasional small fire. Something short-circuits, a pot is forgotten, or a piece of meat is unattended on the broiler. Serious, sustained flare-ups should be easily dealt with by the automatic fire suppression system. 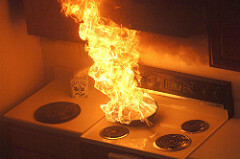 The real danger is when the fire burns too long, the exhaust fan pulls the heat and flames into the duct where it ignites accumulated grease which burns unattended. This is the point where many kitchens start burning to the ground. The only way to prevent fires from happening is periodic inspections and maintenance by chefs and technically competent people. Appliances and exhaust systems that are not properly cleaned invites fire. Improperly maintained equipment could put your insurance coverage at risk. Staff may have just a few seconds before they run out of time. Regular inspections and preventative maintenance prevents serious fires. Phil is a member of the NFPA 96 Committee. 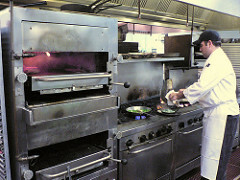 He has written several books on inspecting and the investigation of commercial kitchen systems fires. Thousands of restaurant management, fire inspectors and investigators have attended Phillip Ackland Holding’s accredited one and two day seminars on Understanding Commercial Kitchen Systems. Dates and locations for these seminars are posted and updated regularly on our website. If you would like to have a seminar scheduled in your area contact our event coordinator, Samuel Musico (sam@philackland.com).